My mom gave me piano lessons off and on throughout my growing-up years. I was not at all interested in learning how to play it at the time. My younger sister did much better and now plays the piano beautifully. I promised my mom that I would take piano lessons for a year at college; I did, but still didn’t want to put in the work it would have taken to play well. However, after my husband and I had been married for a few years, I decided I wanted a piano for our house. I thought it might be relaxing to sit down and play it sometimes and that maybe I would finally challenge myself in this area after all those years. Soon after, he bought me a piano for my birthday. Let me qualify that by saying that I don’t normally get birthday presents quite so valuable and that it was a used one we bought from a friend’s family member at a very good price. In our current house it fits perfectly in the hallway leading into the living area. Of course I play it very rarely, yet it is getting nearly daily use now. How perfect that when our older daughter started taking piano lessons two years ago, we already had a piano to use. Yesterday, our younger daughter had her very first lesson. She is so excited about learning to play. I really hope that lasts!! We plan for them to continue taking lessons for a very long time. It is a sacrifice financially, but one that we are willing to make. I know that other families have different desires for their children and dedicate their time and resources to those; this just happens to be a personal priority for us. I don’t think that we will look back ten years from now and regret that we had them take piano lessons. I truly hope that our daughters will develop any talent they may have in this area and use it not only for personal enjoyment but also to minister for God and to others. We are hooked on piano lessons for our girls! Visit Hooked on Fridays to read more. See what others have to show and tell from their homes at Show and Tell Friday. Mmmmmmmmmmmmm, I so wish I had my piano again. I sold it when we moved. My favorite piece to play was Chariots of Fire…what's yours? I took piano lessons when I was younger and then stopped, mostly because I enjoyed playing by ear more than practicing from a book. My parents let me decide if I wanted to continue or not and now, looking back, I really wish they would have made me follow through with the lessons. What a sweet gift that will continue to give throughout many lives. 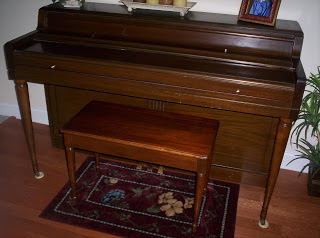 We have the piano that I had growing up and our youngest son took lessons fro several years. I'm hoping that one day future grandchildren will learn to play too! I also wished I could play the piano but I think its quite difficult now coz Im old for that now. Have a nice weekend. Folks don't regret piano lessons, eventually they regret stopping them and not practicing enough. Taking music lessons as an adult is a wonderful thing to do. That's a very pretty piano. It's nice that you and your family are able to enjoy it so much now. I admire people who can play the piano. Thanks for sharing your beautiful memories. You have a lovely piano. I've always wished I could play. My younger daughter is taking a piano class at school. This is her second semester, she really likes it. Thank you for sharing. like you, I also wish I took the piano class but unfortunately, I didn't.. but my sister did.. and from her, I learn how to read the notes.. which in the end I know how to play one or two songs by myself.. and your piano is really pretty! Am sure that your daughter would enjoy playing them! thanks for sharing.. have a great weekend! I hope your daughters enjoy their piano lessons. I always wanted to learn to play the piano. My parents couldn't afford lessons when I was a child. When I became an adult I thought I was too old. But I was totally inspired to hear that a friend of mine (who is a few yrs old than me) has started taking piano lessons. There may be hope for me yet! First of all thanks for sharing this blog and letting us to know about your daughter,piano and yourself. I really enjoyed going through it.